This is a fun treat for the family. One they will want time and time again as it's delicious. Start by mixing 1 lbs of Jimmy Dean Sage sausage with 1 lbs. of maple sausage. 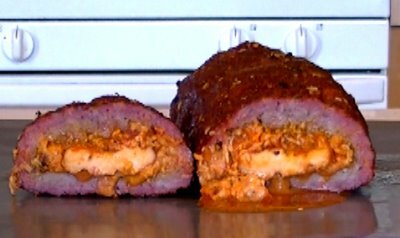 Once the sausage is mixed form a ball and transfer into a 1 gallon Ziploc bag. Press down and work the sausage to the sides and top of the bag. Release any air and zip shut. Continue until you have formed a symmetric flat sausage square. Set this aside for later. Cut 1 pre smoked or cooked chicken breast in half down the length of the chicken breast. See image to the right. In a medium pan brown the sausage you set aside. Drain off any fat. In the same pan heat the pepperoni to cook off most of the grease. Once heated place on paper towels. Using more paper towels blot up the excess grease. Now clean the pan and heat the Canadian bacon just enough to slightly brown it. In the same pan, place a slice of butter. Add the peppers, onion and garlic. Sauté in the butter until the garlic starts to brown. Once the garlic starts to brown remove the pan from heat. Now grab the flattened sausage square that you set aside. Open the Ziploc bag containing the sausage. Using a pair of clean scissors, cut along both sides and fold back the top plastic flap exposing the sausage. Spoon on 3-4 tbsp of your favorite Prego pasts sauce. Evenly spread it leaving 1" bare border all the way around the edge of the sausage square. Add 1/2 the garlic on top of the sauce. 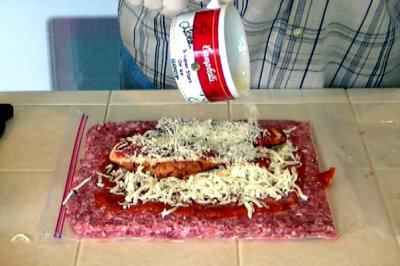 Sprinkle on some Mozzarella cheese covering the pasta sauce. Lay on the two chicken breast halves. Spoon a 2-3 Tbsp of Prego on top of the chicken breast. Sprinkle on some Sun Dried Tomato & Garlic Pesto mix. Add the remaining garlic. Now add a good layer of Parmesan cheese. It's now time to roll a fatty! Grab each side of the bag and pull the sausage up and around sealing the top. Close shut the seem and ends. Sprinkle on a light dusting of garlic powder followed by a good coating of Jack's Old South Hickory dry rub. Now sprinkle on a light coating of the Sun Dried Tomato & Garlic Pesto mix. Make sure you get it on the sides and bottom as well. 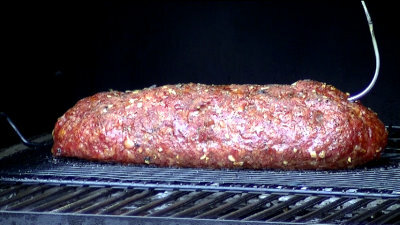 Once seasoned, roll the Fatty on to a smoking rack or baking sheet and transfer them to the grate in your smoker. Be careful not to rupture the outer sausage layer. You want to keep all the goodness inside. Smoke @ 230 degrees until the internal temperature is 165 - 170 degrees. This usually take 2.5 to 3.5 hours. Traeger owner set your Traeger to the smoke setting for 1 1/2 hours then increase your temperature to the 225 setting. Once the desired temperature has been reached, remove the fatty's from the smoker. Cover with foil and let then stand for 15-20 minutes. Slice the fatty into 1" thick slices and serve. Hope you enjoy this recipe.